Gemstones, titanium, silica sand, rare earth elements, lead, copper, zinc, barite, coal and limestone are among the gazetted minerals found in Msambweni, Matuga, Lunga Lunga and Kinango constituencies of Kwale County. Kwale is well endowed with minerals, that is not the question. Question is how do the locals co-exist with the latter? 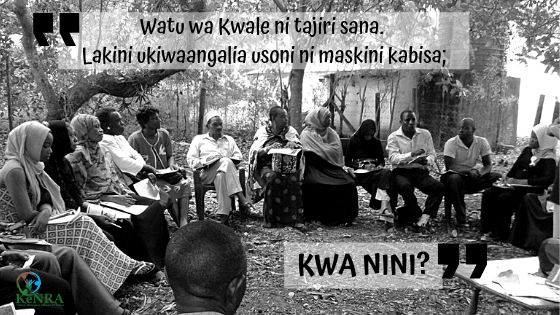 Because despite having these valuable resources, Kwale is still ranked among the poorest counties in Kenya, with a population of 71% living below the poverty line. Knowing of the mineral existence and having companies like Base Titanium carrying out mining activities raises the expectations of Kwale locals a bit higher. They expect to reap of the benefits that come with it including compensation for those displaced to pave way for the mining fields, corporate social responsibility from the mining companies, revenue share from the minerals (70-20-10) etc. But what is the reality on the ground? There is mixed reaction between the communities here. Some feel Base Titanium has been of benefit to them, while others are counting their losses. Where is the disconnect? To start with, those happy with Base Titanium are probably the beneficiaries of the CSR activities that include health facilities, improved infrastructure, educational scholarships, and community programs among others. The other group that is counting losses, narrates of their lands that have not been compensated, 20 – 10% of the mineral revenue shares they have not seen, miembe na minazi haizai kama hapo awali (mango and coconut trees are not as fruitful as they were initially), environmental pollution and the many other negative impacts of mining. On the other hand, there are artisanal miners, comprising of women that ask for government help as they lack improved mining tools. They haven’t been taught to add value to the minerals as they mine and sell the mineral as it is. This becomes a loss on their side because the middle-men they sell to, add value to the minerals and sell at way better prices than the latter. These artisanal miners, most of them also lack mining permits, hence are forced to sell off the minerals to middle-men, at low prices. By the quick sales to middle-men, locals in Kinango say only foreigners (those living outside the county) get to benefit from the minerals. That aside, there are no near facilities to deal with first aid in any case of casualties during mining. Common cases here being snake bites and malaria from mosquito bites (the mosquitoes come from stagnated water from abandoned mining holes that have over time been filled with water). Artisanal miners don’t refill the sites after they are done mining, leaving the sites open thus the issue of snake and mosquito bites being rampant. Some other issues include double land allocation where someone was allocated land during relocation by Base Titanium, but finds other occupants already living in the same location. Others have compensation letters but they were left behind during the relocation process. Another group lives near the mining site, meters from the mining site hence directly affected by dust, sound and vibrations from the mining activities. In addition, no clean water is found in these areas, and no basic amenities. With this, residents say mining is both a curse and a blessing, and are wondering what the situation would look like if minerals were discovered all over Kwale County. It is with these reasons that Kwale Mining Forum and the National conference on Mining, Oil and gas were held to see that minerals are working for the good of the people and not vice versa.